Sailing the San Blas Islands Panama has got to be one of the most amazing experiences in the world. The 365 islands, off the north coast of Panama are pretty much the image everyone imagines when you think of a Caribbean paradise. Tiny islands dotted around the turquoise waters, some with only a couple of palm trees and a hammock. One of the few ways to access these islands is by boat. And they are an excellent way to make the crossing between South and Central America. 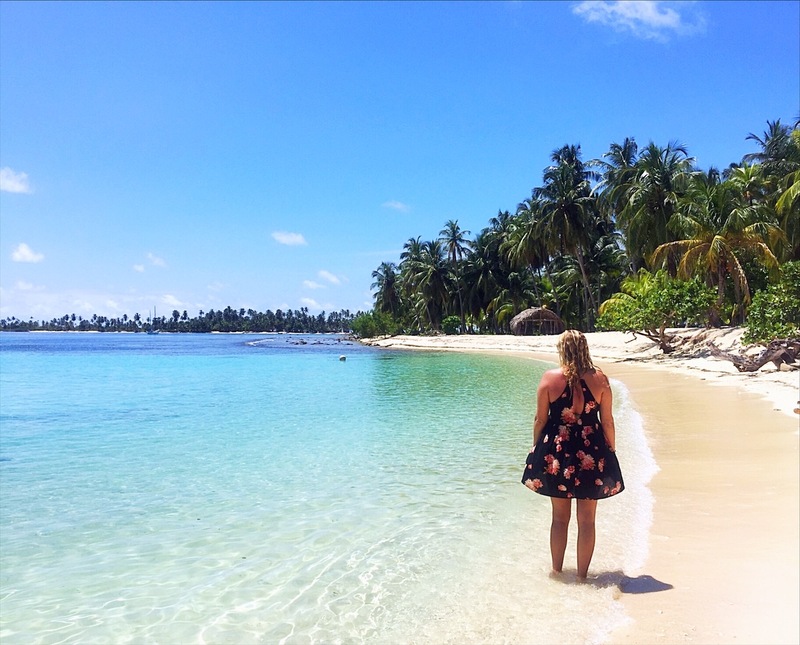 Rather than flying from Colombia to Panama, I was lucky enough take a San Blas Islands tour with Wild Card Sailing – 6 days and 5 nights of pure paradise. And boy was it an incredible experience! 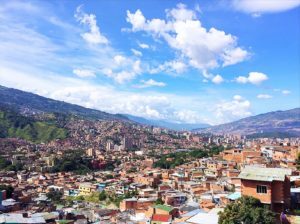 Looking to cross from Colombia to Panama or Panama to Colombia? Skip the flight! 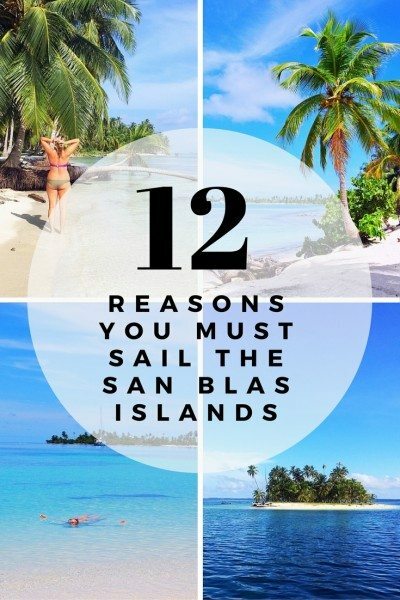 Here’s why you should go Sailing the San Blas Islands instead! And keep reading as I have an awesome offer for all those ready to book your trip at the end of this article. 1. You’re on a mother$@*#ing boat! A yacht chilling next to the beautiful islands while San Blas sailing. Ok, I have a real thing for boats. I absolutely love the feeling of being out on the open water bobbing up and down. To me, there is no better way to travel. So just the idea of being able to boat Panama to Colombia rather than taking a stuffy plane was right down my alley. And what a beautiful boat it was. Our 60 ft yacht the Wild Card was absolutely huge, boasting enough bedding for 20 people. And as we were a group of 11, there were tonnes of space on board. Not to mention a gorgeous chill area on the upper deck with bean bags and cushions perfect for sunbaking and reading a book. Needless to say, a sailing San Blas trip to the remote tropical islands between Colombia and Panama is a once in a lifetime experience. Every day is spent on a different island where you can snorkel, sunbake, play volleyball and just ultimately chill out. While prices for sailing in San Blas Islands start at $550 for the 6 days, once you account for the cost of a flight it’s totally worth it. And to me, it was definitely one of those things I had to splurge on as I knew I was never going to be able to experience this again in my life. 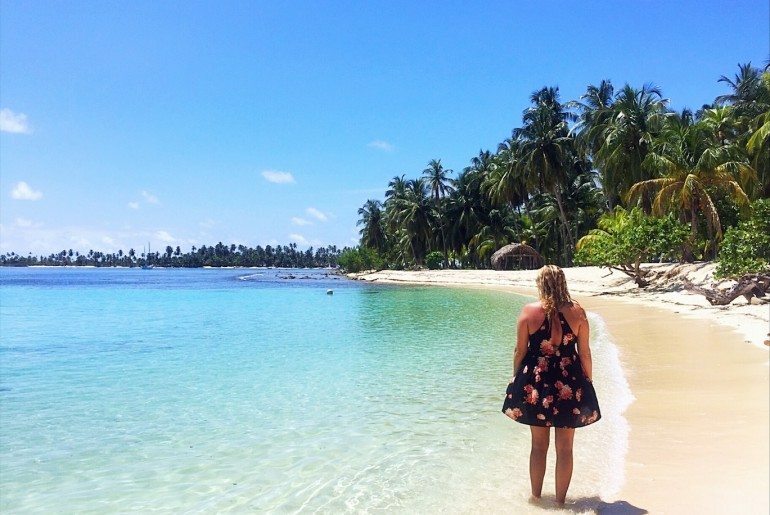 If you’re looking to travel to Panama from Colombia or vice versa, and don’t think you’ll be back in this part of the world anytime soon, I highly recommend you just spend the money and enjoy the experience of a trip to San Blas Islands. Floating my days away in the Caribbean on my San Blas tour. Photo credit: Fran Cesca. Sailing the San Blas Islands Panama is all about taking a break and chilling the eff out. The days you spend actually sailing force you to just do nothing. Which is kind of nice after having full-on traveled for a while. I got a tonne of reading done, watched a few of my faves on Netflix and topped up my tan. The days you aren’t sailing are totally relaxing as well. Start your day off with a morning swim and then just laze around on the deck. Could life get any better than when you sail the San Blas Islands? Ummmm, nup. Heading for the Caribbean and not sure what to wear? 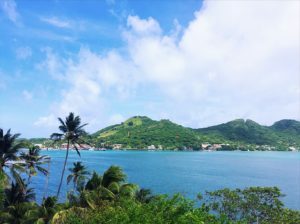 Check out this excellent packing list for the Caribbean Coast. While you’re sailing the Caribbean on the Wild Card there are plenty of fishing opportunities. The crew have two lines that run out the back of the boat while you’re sailing. And one of the best parts of the day is when you hear the fishing line start clicking, the boat slows down and you know you’ve got something on the end of the line. There are Mahi Mahi, Tuna, and plenty other fish biting and if you catch one, the crew will treat you to some super fresh sashimi or a delicious seafood pasta. 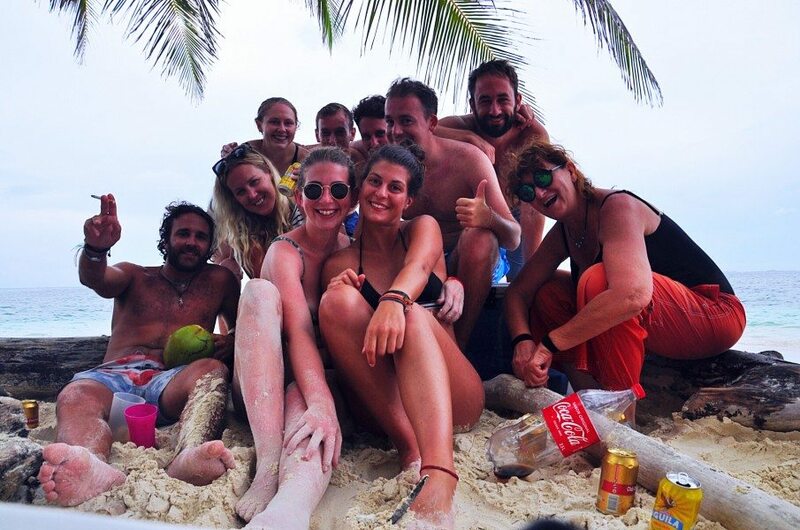 Some of the awesome friends I made while sailing the San Blas Islands. Photo credit: Fran Cesca. One of my favourite parts of my San Blas experience was the amazing people I met on the journey. Spending over 600 hours with a group of people swimming, snorkeling, partying and napping brings you pretty close. You’ll meet folk from all around the world and you might even find a few buddies to keep on traveling with. Now that I’ve mentioned partying, we had so much fun making our own parties on the islands. One day we even built our own fire and had a killer water volleyball match in the sea, in which my team (of course) was victorious! 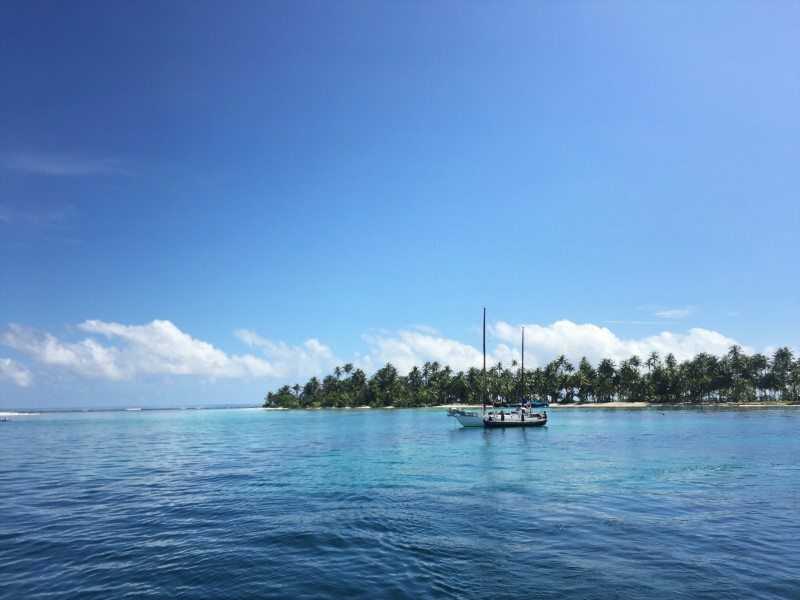 You can’t help but have a few bevvies when you’re in a location as stunning as this, and it makes the experience of San Blas Islands sailing all the more fun. Dolphin spotting is always so fun and not something that happens a hell of a lot. On our San Blas Islands trip, we saw so many dolphins it was incredible. They would swim up alongside the boat most mornings and we’d all watch absolutely mesmerized. Sometimes they’d hang around for an hour swimming in the wake of the boat. Looking out over one of the most incredible reefs in the world while sailing the San Blas Islands. The snorkeling in San Blas Panama is actually some of the best I’ve seen, and that’s including the Great Barrier Reef. There are a tonne of brightly coloured fishes, some are even luminescent. But the coral is the star of the show. Snorkel the San Blas for a while and you’ll see huge trees of colourful coral with tiny fish darting in and out, brain coral that, as per the name look like a huge human brain and sea fans that as you can imagine look like bright and colourful hand fans. 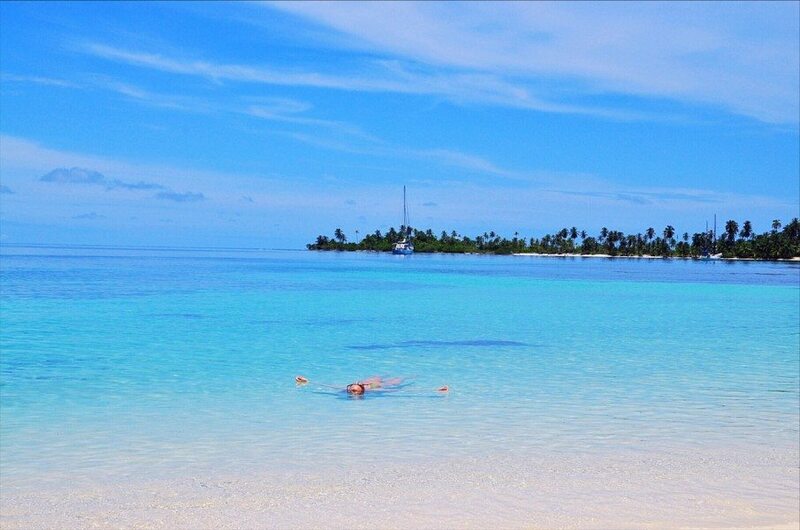 San Blas snorkeling is just incredible! One of the most memorable parts of Sailing the San Blas Islands Panama was the night our Chef Tati cooked us super fresh lobster the crew had bought from one of the Kuna people. While you’re sailing the Kuna people will pop up in their canoes beside you selling all the fresh seafood you could ever ask for. And our lobster in garlic butter sauce was just so moreish. Speaking of food, the meals that are served on the San Blas Tours from Panama City and Cartagena on The Wild Card are so delicious. We were treated to fresh lobster, seafood pasta, Greek doughnuts and some of the most epic nachos I’ve tasted. After living on a backpacker budget for the last few months this food was an absolute treat! 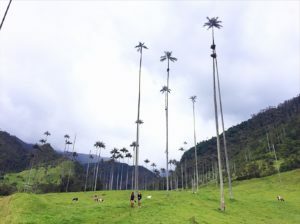 The Kuna people are the official landowners of the San Blas Islands Panama. They are a small group of 50,000 people that live on the 49 major islands of the San Blas. They survive by fishing, picking coconuts and selling their artwork. One of the day’s activities is to visit a Kuna village and learn about their culture and how they survive on these truly remote islands. It’s such an interesting part of Panama and I’m so glad I experienced it. 12. Did I mention you’re on a boat? I know I’ve gone on and on about this, but just the fact that you can take a boat between Colombia and Panama and vice versa rather than flying is a once-in-a-lifetime experience. ‘Yo ho, yo ho, a pirate’s life for me’. Have you been sailing the San Blas Islands? What was your favourite part? Let me know in the comments. Wild Card Sailing runs the tour of San Blas Islands from Panama City to Cartagena and vice versa once a week with two boats – the wild card and the sovereign grace. The journey takes 6 days and 5 nights. 2 days and 1 night of those are spent in the open water. E.g. you won’t be getting off the boat for that time, and the seas can be a little rough, so make sure you’re mentally prepared for that. The trip includes all meals, ice for drinks and snorkelling gear. All you really need to bring is booze and mixers. You can check prices and availability HERE. And if you book through THIS LINK using the code – EW090817 you’ll get $10 off AND a FREE bottle of rum! Don’t say I don’t look after you! if you have any problems trying to book with the code just email the team at info@wildcardsailing.com and quote the code and they’ll organise it all for you. are you sailing the san blas islands to colombia? these will help you with your planning.